TOUR: See how we make group plans quick and easy! Quickly select your most recent contacts when you sign in to your free account. 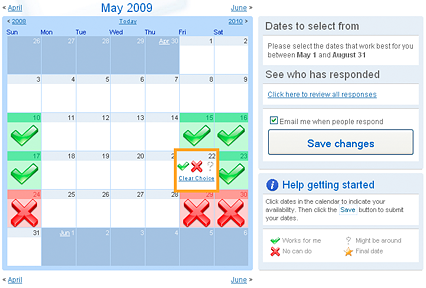 As you move your mouse over the dates in the calendar, select if you're available, not available or not sure. It's that easy! Works for me if yes, you are available on this date. No can do if no, you are not available on this date. Might be around if maybe, you will know you're available on this date soon. 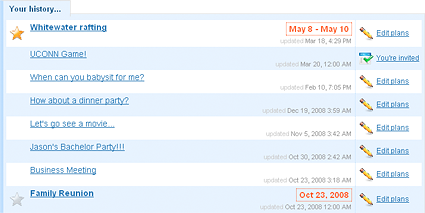 View everyone's response at a glance or move your mouse over any date to view who said yes and who said no. Finalize the date that works best and we will send an email to everyone letting them know when the plans are taking place. We do all the busy work so you don't have to! Your free account gives you access to your own "recent plans" page, which helps you manage and keep track of all your plans. It includes plans you have created and plans that you have been invited to.